Very good! I made this for dinner for company (served over egg noodles) and they ended up requesting the leftovers to take with them! I made a few changes based on other reviews. 1 - I substituted 1/2 cup sauteed onions for the dried onions. 2 - I added a half tablespoon of Old Bay. 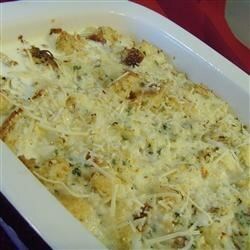 3 - I couldn't find unseasoned croutons (and was worried based on other reviews of the seasoned overtaking the crab taste) so I used bread cubes. This was PERFECT for company! I will definitely make again!